Freedom of religion is one of the basic principles of the United States. Throughout the history of the United States, religious leaders have had an impact on American society. Most communities are dotted with churches that reflect the religious preferences of the people of the region. Religious leaders within a community provide leadership for their followers. 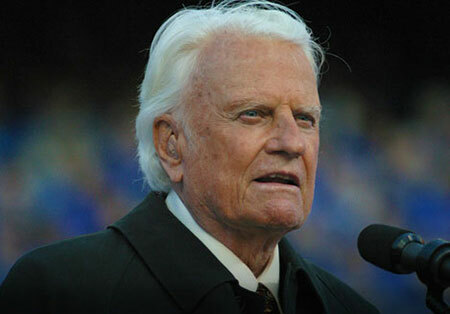 According to some estimates, the Christian evangelist Billy Graham preached to more people than anyone else. Graham began preaching in tent revivals as he traveled the United States. Soon he began to preach on the radio and later on television. His use of these means of mass communication allowed him to reach millions around the globe. Graham's mass appeal enabled him to influence American political and social issues. He had regular visits with U.S. presidents, most notably Dwight D. Eisenhower, Lyndon B. Johnson, and Richard Nixon. 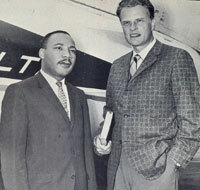 Graham was a supporter of the civil rights movement and he developed a friendship with fellow minister Martin Luther King Jr. The United States was founded on political principles, and throughout its history, people have continued to contribute politically to the nation. Presidents, governors, and Supreme Court justices are just a few of the individuals whose effective leadership shapes our American national identity. 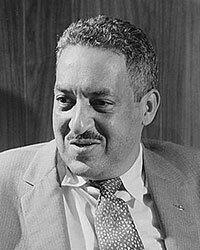 Thurgood Marshall began working as a lawyer for the National Association for the Advancement of Colored People (NAACP) in 1934. It was there that Brown won several important cases involving equality for African Americans. In 1954, Marshall's victory in Brown v. Board of Education paved the way for desegregation of public schools, thus changing the United States forever. Marshall became one of the most prominent lawyers in the United States. President John F. Kennedy appointed Marshall as a federal judge, and President Lyndon B. Johnson later appointed him to the U.S. Supreme Court. In 1967, Marshall became the first African-American Supreme Court justice. Entrepreneurship also contributes to the American identity. There are many men and women who have created businesses and provided goods and services to the United States. One of the most successful entrepreneurs in U.S. history was Andrew Carnegie. Andrew Carnegie immigrated to the United States from Scotland. After a series of various jobs, Carnegie started his own steel company, which eventually became the largest steel company in the world. He became one of the wealthiest men in the United States during his time. Carnegie later sold his business and spent the rest of his life pursuing philanthropic interests. Carnegie donated nearly $5 million to New York City libraries for the addition of library branches. 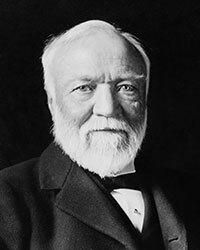 Carnegie donated money for many charitable causes, and he also established a college, Carnegie-Mellon University, in 1904. In fact, Carnegie donated about $350 million to charities, foundations, libraries, and universities. This amounted to almost 90 percent of his fortune. In his 1889 article "The Gospel of Wealth," Carnegie urged other wealthy persons to use their fortunes to benefit and improve society.